Uses stock clutch rod hole (where possible) for ease of installation. The LF Series Hydraulic Clutch Master is a revolutionary design for retrofitting hydraulics into the classic cars. The common approach was to use a 3/4" Master connected to the pedal directly. To get the proper pedal pressure and stroke the cylinder needed to be raised higher than the stock clutch rod linkage hole. Interference issues prevents this in many cars. These issues resulted in either a heavy pedal pressure or a very short stroke or both. Modern Driveline solved these issues with innovative design. Integral to the design is the design and layout of the car itself. As a result, different techniques (design solutions) are used depending on the vehicle model. In some cases the amount of stroke which can be obtained with a direct connection between the pedal and the cylinder is not enough. In other cases large brake boosters prohibit positioning of the cylinder where it could be beneficial. As a result, we use two basic design solutions. The linkage design is the most innovative. Combining mechanical linkage with proper hydraulic cylinder sizing results in a compact package with full pedal stroke with a Light Foot. The cylinder itself is resized and optimized for this use. It's small size insures it will fit in the majority of applications. Mechanical linkage is added which makes it possible to use the clutch rod hole (where possible), allow positioning of cylinder perpendicular to the firewall, and provide mechanical advantage thus reducing the pedal pressure required to operate the clutch. The mechanical linkage design also allows the full stroke of the pedal to maximize clutch modulation. Typical usage of this design is in the Ford product line. For those cases where the firewall is angled and/or other components limit the positioning of the cylinder and linkage we designed the Angular Linkage system. Again, part of the design is to calculate the proper cylinder displacement (stroke and bore) and the positioning of the linkage (rod) where it attaches to the pedal. The result of the design accomplishes the light pedal feel while fitting the requirements the vehicle presents. Typical usage of this design is in the GM product line. Complete solutions of master and slave need to be optimized with matching fluid volume. For this reason we offer kits specifically matched to our slaves or to existing slaves on the market. 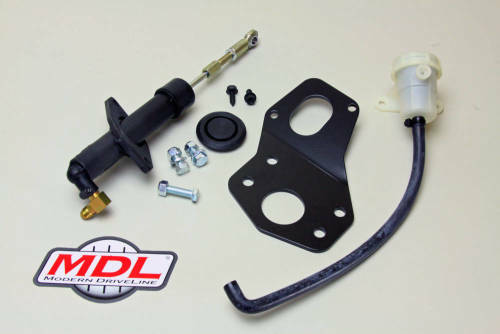 Rounding out the kit is an included remote fluid reservoir (Tri-Five Chevy is integrated). A typical complete solution consists of the LF Series Hydraulic Clutch Master, a steel braided line of appropriate length, and the LF Series External Hydraulic Clutch Slave or the LF Series Internal Hydraulic Slave.